Wish we could say no rain barrels were harmed during this week’s minicourse at SLA Beeber but, as the photo above indicates, that simply isn’t true. 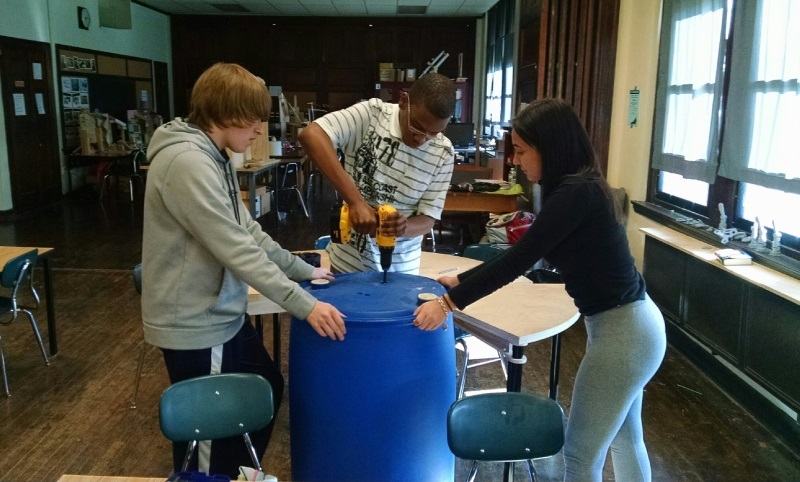 Ninth grade students have begun to imagine a smarter, more functional rain barrel for Philadelphia residents and businesses to manage stormwater on their property. This week, one group of students worked in the makerspace to build an enclosure prototype for the rain barrel while the other group investigated different sensors to measure water level in the barrel and figure out how the sensors fit into the physical design. 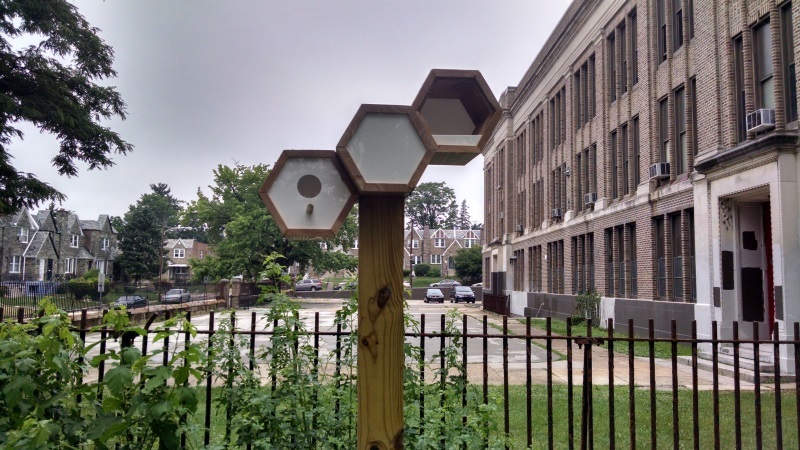 As with last year’s solar-powered birdhouses, greenSTEM is collaborating with Public Workshop to guide the students in designing and building a functional addition to their schoolyard and garden. We’ll be documenting the progress here—sharing the designs, code and challenges along the way. Learn more about rain barrels and Philadelphia Water’s Rain Check program here. Now available: summer rental, 1BR with porch, ready for move-in at Science Leadership Academy’s Beeber campus. 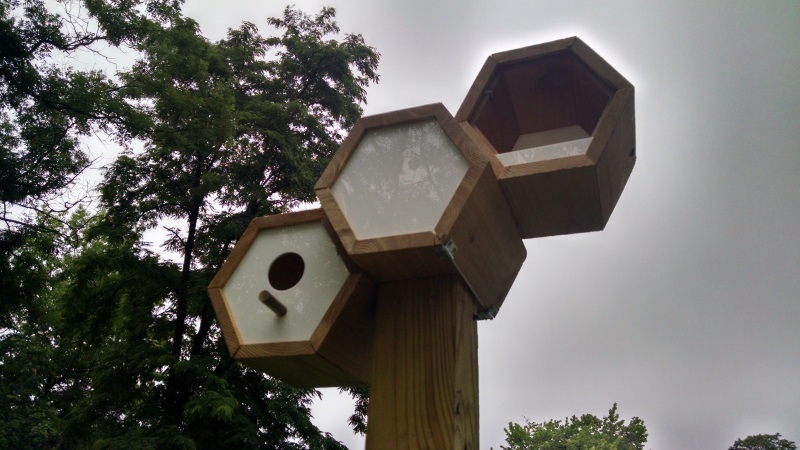 As detailed in a previous post, a group of 9th graders at the school spent the last 8 weeks designing, prototyping, and building solar-powered, webcam- and sensor-enabled birdhouses (and one bat box). Philadelphia Water and Public Workshop worked with the students to hone their ideas and craft the houses in the school’s excellent makerspace. Students Amani and Aaliyah worked on this honeycomb design that’s perfect for cavity nesters such as sparrows, wrens, and chickadees. The middle compartment is sized to contain the electronics and infrared nest camera. Installation in the schoolyard came down to the very last day of school, so the majority of the observing, sensing and solar-powering will take place when classes resume in the fall. 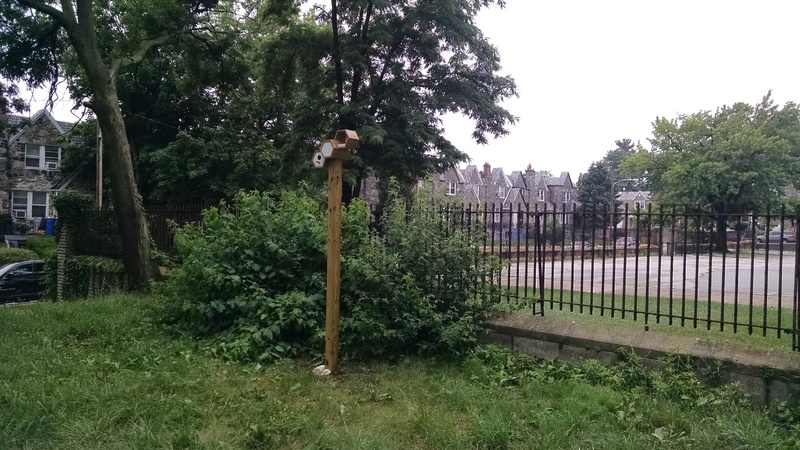 Two other birdhouses and a bat box are nearly ready for installation, too—we’ll be scouting locations around the city for them to be installed. Thank you to Public Workshop’s Alex Gilliam and Jason Depenbrock, as well as sophomore Brodie Bauman, for their design and construction expertise. Additional thanks to Drexel’s ExCITe Center for purchasing materials. Summer is here but we’re still working—wait until you see the other designs. Ninth grade students at Science Leadership Academy’s Beeber campus began the challenge this week of creating their own solar-powered, video-capturing, soil-moisture monitoring bird houses—and maybe even a few bat boxes. Each unit will be equipped with its own Arduino/Raspberry Pi device that will harness the solar power and use WiFi to transmit soil-moisture data and a live “peep show” (get it, because they’re birds?) courtesy of the infrared camera, allowing students to observe the birds inside. As if all of the technical aspects weren’t enough to consider, the students also have to be aware of what kind of birds they’re building for, and choose their houses’ specifications accordingly. So this week, in becoming aware of their tenants, the students crafted cardboard to scale models of their birds of choice with the help of Alex Gilliam, director of the organization Public Workshop (which collaborates with youths and their communities to help them shape the design of their cities through workshops and leadership programs). And check out the results! Here we have a few American Robins, a few House Sparrows, and one American Chickadee. 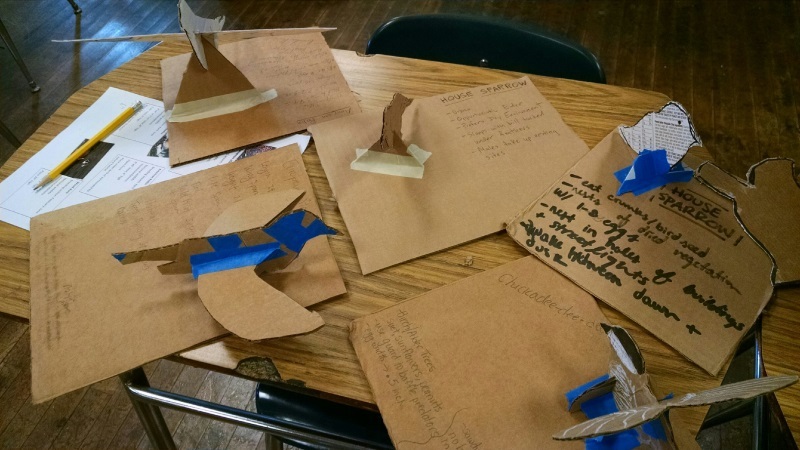 Some students also scaled cardboard models of starlings, bluebirds, and bats. Gilliam encouraged the students to account for both the size of their birds with their wings at their sides and fully spread. They’re each taped to a cardboard sheet inscribed with pertinent information—things like diet, preferred habitat, and how they prefer to nest. Next week the students will start modeling cardboard prototypes of their birdhouses/bat boxes for their cardboard creatures in order to get the designs perfect for the final products.